This can be a wonderful experience however it does require preparation. Planning a family reunion can take up to two years to do properly so allow yourself plenty of time. Whilst Long Weekends (Easter, June, October and Christmas) are thought to be ideal for such events these periods are usually the busiest in Hill End when many campers and tourist flock to the area and stretch the existing food and accommodation facilities to the limit. Consider choosing a time outside these dates and make tentative bookings to reserve your place. Spring and Autumn are the most popular times to visit Hill End. The weather is usually milder and the village looks a picture. Winter can be very cold (and may even produce a dusting of snow) and Summer can be very hot and dry. If you are planning on having more than 10 or so people attend and you wish to stay overnight, then it is wise to consult with the accommodation houses in the district to ensure that there are no other functions planned for the same time and that bookings are available. If you are planning on having a luncheon or dinner, then contact the food outlets well beforehand to make certain that they can cater to your needs. If self-catering then BBQs, shelter sheds and public toilets are located in Bill Lyle Park, in the centre of town and also at the Visitors Centre. Take away food is available and the store can provide basic food supplies however if you have specific needs then you should bring your own provisions. You will want to allow plenty of time for your group to enjoy the ambiance of the village but it is also good to have some set activities planned so that they can make the most of the experience. You should have an idea of the age range of those attending and cater accordingly. If there are older members of the family attending, then be aware that Hill End does not have paved footpaths and the ground is uneven. Sensible and comfortable footwear is a must. Historic buildings are spread out around the village and walking is a lovely way to visit them however if distances are an issue then consider hiring a minibus to move your group around. Don’t forget your hat and sunscreen. If younger members of the family will be attending, then consider hiring gold pans and heading to Golden Gully at Tambaroora for an hour or two to try your luck. Alternately contact Ted Abbott on 02 6337 8251 and he can provide the equipment and show you how to do it at a very reasonable cost. Spend some time at the Visitors Centre Museum to get an overview of the village history. Collect a map of the village which will guide you around to the most popular locations. If family history is your thing, then contact Daphne Shead at Hill End Family History well beforehand and make arrangements to visit her at the rear of the Royal Hall. She may have a record of your family in her collection and may even know where they lived or worked. Explore Hill End can help arrange that special visit. Chris & Jeannie provide tours catering for all ages and fitness levels, specialising in providing a unique experience to match your family interests. 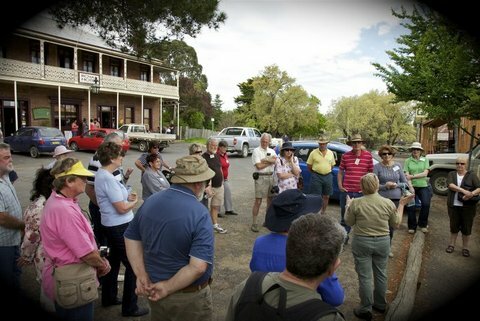 National Parks and Wildlife Service can arrange Village tours for groups for a small cost. Contact the Visitors Centre on 02 63378206 for more information. If you have more time to spend in the area then head to History Hill for a few hours or take a drive down the Bridle Track to the Turon River, well worth the effort. See our What to see and do in Hill End page for more ideas. Most of all enjoy the experience of walking in your ancestors’ footsteps.